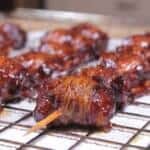 Chicken coated in Jeff's original rub (purchase recipes here), wrapped in bacon and threaded onto a long skewer is an easy and tasty treat that goes great with other grilled and smoked items such a burgers and hotdogs. Did I mention it's wrapped in bacon? 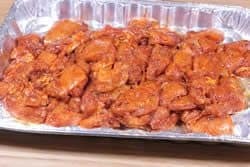 Many of you have commented on how great my rub goes with chicken and I have to agree that it pairs together extremely well. 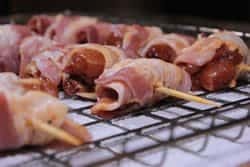 These smoked bacon wrapped chicken skewers are no exception and I highly recommend that you try it out. 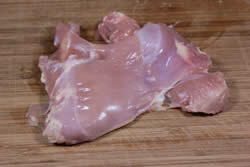 Lay the thighs out on the cutting board and remove any visible fat with a sharp knife or kitchen scissors. You don't have to spend a lot of time on it but just removing most of it will produce a better end product. 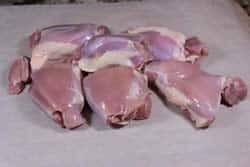 I tried to cut the chicken into pieces that are bite size but that is a very subjective term. Whatever you visualize as bite size, cut them that size. I got about 6-8 bites from each thigh. 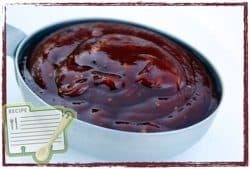 Many of us know that my rub is one of the secrets to great tasting smoked chicken, but if you let it sit on the chicken for a while and sort of marinate, well, it gets even better (if that's possible)! 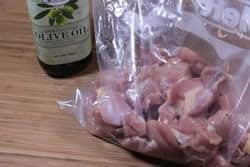 Put the chicken pieces into a zip top bag and pour about ¼ to ½ cup of olive or vegetable oil over the top of them. Massage the bag to make sure all of the chicken is coated with the oil as this helps the rub to stick to the meat. Add ½ cup of Jeff's rub to the bag and once again, massage the bag really well to coat all of the chicken. 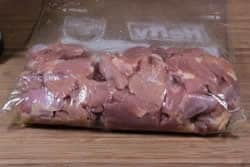 Place the bag of rubbed chicken in the fridge for at least an hour but overnight would not hurt anything. 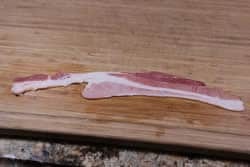 I don't like to be stingy with the bacon so I cut mine in half. 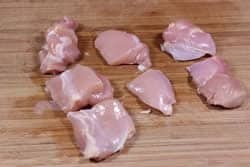 Cut yours into thirds if you wish and if it will fit around your bite size pieces of chicken. 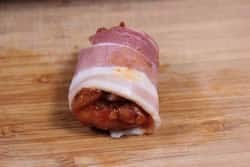 This is the really complicated, highly scientific part of the process: lay a piece of the chicken on a piece of the bacon and roll ‘er up! Push a skewer through the bacon wrapped chicken piece..
Do that about 5 more times on the same skewer. 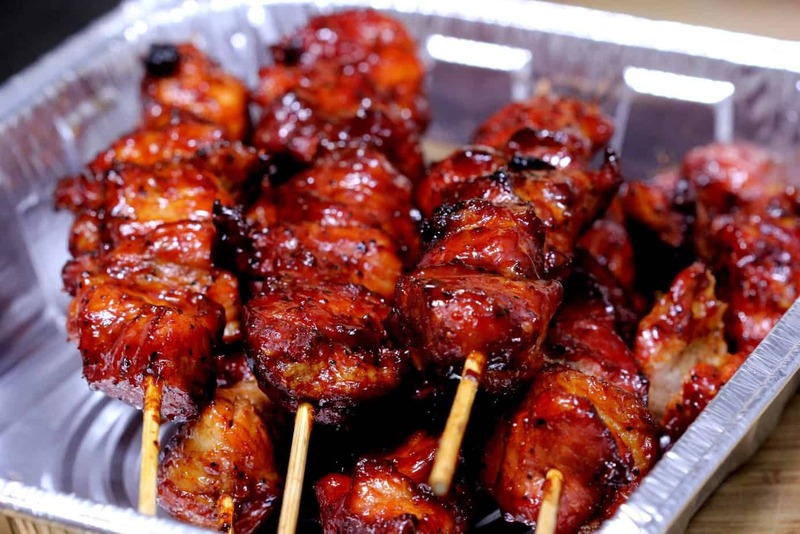 Make as many skewers as you can with the chicken that you cut up. 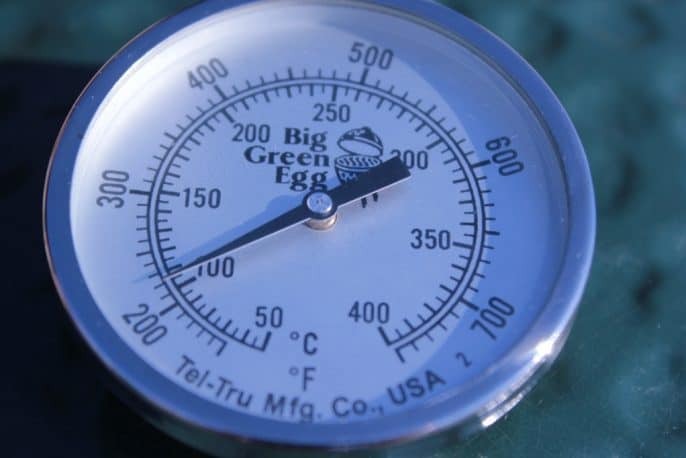 Set up your smoker for cooking at about 250°F if possible. 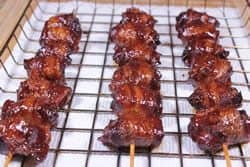 Cooking these a little hotter will help the bacon to crisp up and chicken can definitely handle the higher heat just fine. 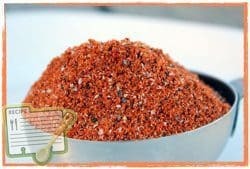 I used pecan just because it's my favorite and it goes really well with a lot of things.. poultry is one of them. As usual, to make it really simple, I loaded the finished skewers onto bradley racks. 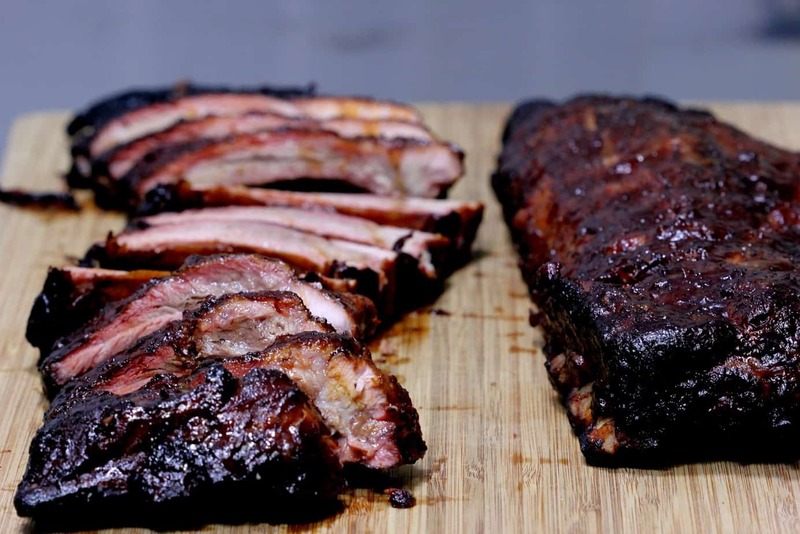 These racks are about 11 x 15 and if they will fit on your smoker grate, they are very, very handy to have. 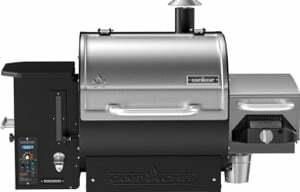 Set the bradley rack on the smoker grate or you can place the chicken skewers directly on the smoker grate. Smoke cook at 250°F for about 1.5 hours, sauce them real good then let them go another 30 minutes before taking them out of the smoker. 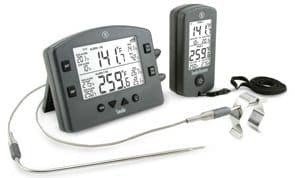 Use an instant read thermometer such as the Thermapen (reads in around 2-3 seconds) to check each piece and make sure it has safely reached 165°F. 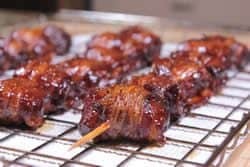 Pull them off the sticks to serve as appetizers or serve an entire skewer to each person as an entree with home fries or even some baked beans. Chicken coated in Jeff’s rub, wrapped in bacon and threaded onto a long skewer is an easy and tasty treat that goes great with other grilled and smoked items such a burgers and hotdogs. 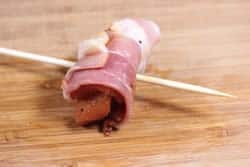 Did I mention it’s wrapped in bacon? 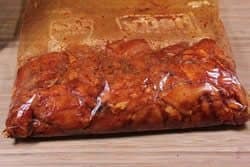 Add ½ cup of Jeff’s rub to the bag and, once again, massage the bag really well to coat all of the chicken. 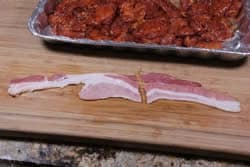 I don’t like to be stingy with the bacon so I cut mine in half. 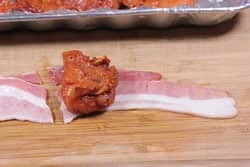 You may be able to cut it into thirds if you wish as long as it will fit around your bite size pieces of chicken. 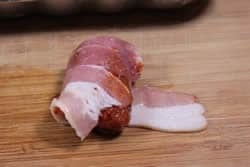 Lay a piece of the chicken on a piece of the bacon and roll ‘er up! 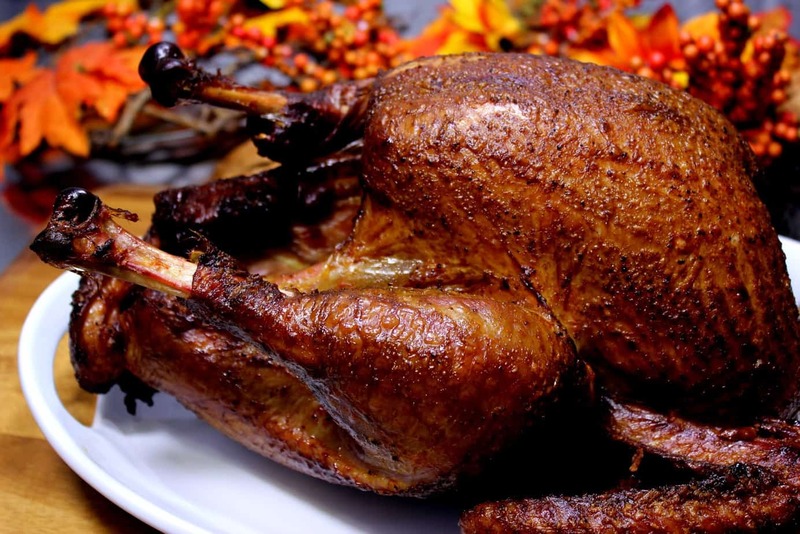 I used pecan just because it’s my favorite and it goes really well with a lot of things.. poultry is one of them. 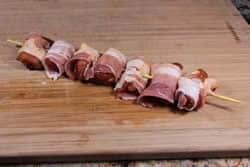 I made these bacon wrapped chicken skewers last weekend. Without question the best smoked chicken I have ever had. Fabulous recipe. Made these tonight and they were a huge hit. 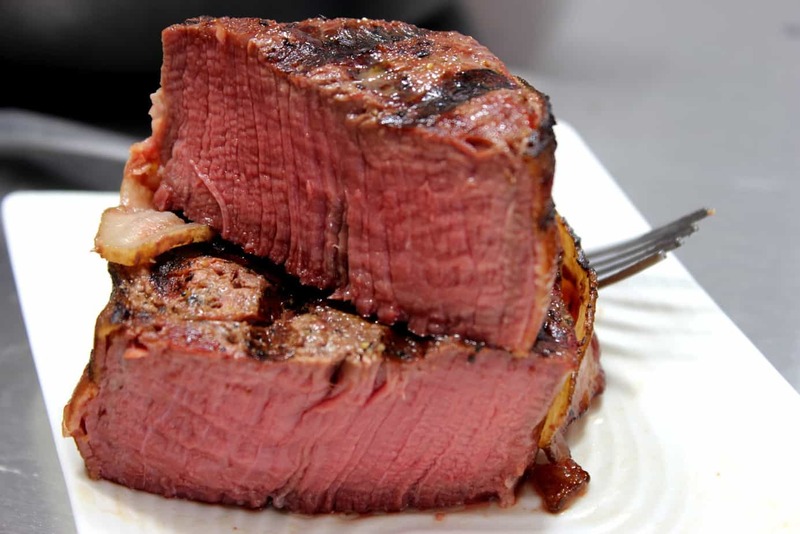 I used Jeff’s rub recipe, however used Montgomery Inn for the sauce. This had just the right heat, sweet mixture. 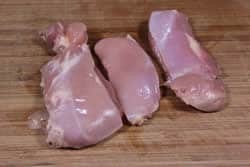 I have never used chicken thighs before, however I think that’s what made these vs. boneless skinless breasts. 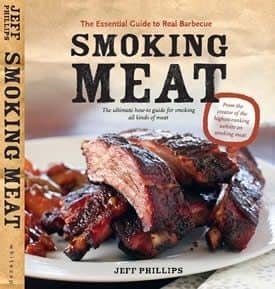 Glad I trusted Jeff and his recipe because it is one of our favorite items I’ve ever smoked. 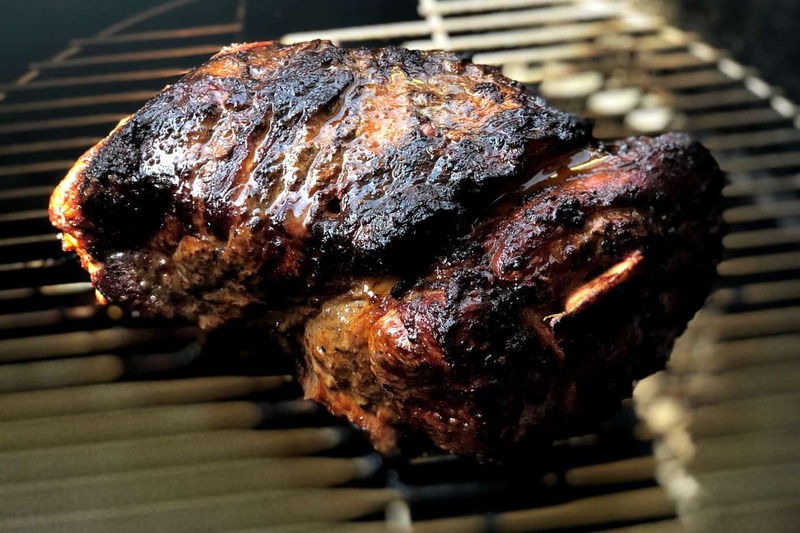 Used Mesquite wood on my Weber Smokey Mountain. Thanks so much for the fabulous recipe. 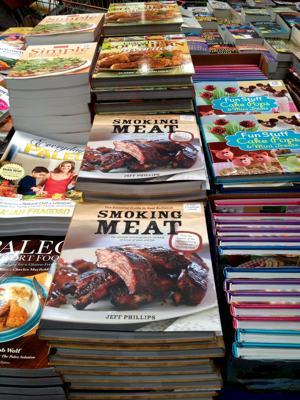 Darryl, Jeff’s recipe is very low is sodium and I high recommend buying it. I use it for everything!! 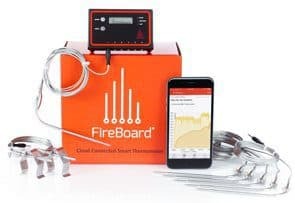 Comments won’t let me post link. 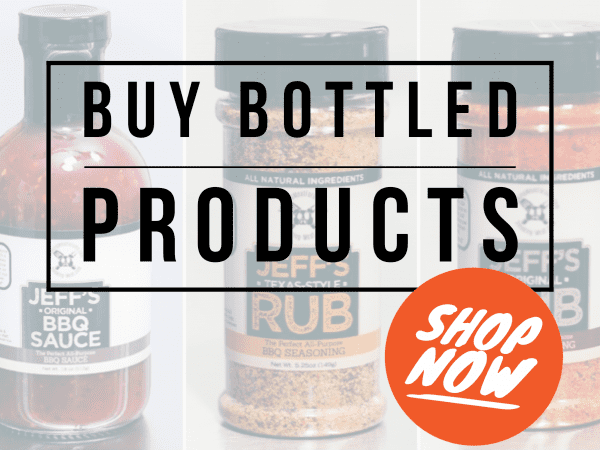 Search for “The Science Of Rubs” very good read on low or no salt rubs! 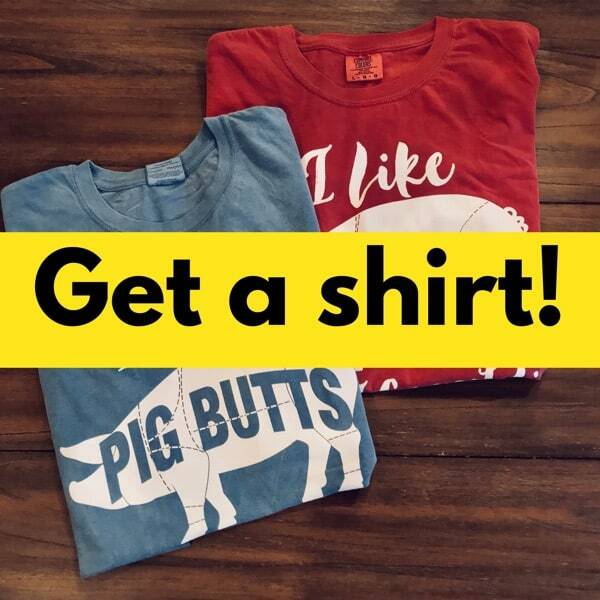 Made these this weekend and they were a huge hit. They were awesome. The bacon was cripy and help up and the chicken was still moist and tender.. Followed the instructions and they were perfect.